"But you don't go to Alcoy to see grown men and women make fools of themselves, either. A welcome balance is struck between all-stops-out abandon and respect for traditions kept alive over the centuries. This is fun taken seriously." Almost one hundred and fifty celebrations of "Moors and Christians" take place over the length and breadth of the country. The origins lie in the battles following the re-conquest in the 16th and 17th century. As early as the 17th century, groups of "Moors and Christians" drove through town, accompanied by noisy bands. A "battle" ensued with skirmishes and dances, ending with the triumph of the followers of the Cross, who surround the Moors and defeat them. Then it's conversion or death for the Moors, and finally homage to the patron saint of the town. Everything goes on amidst the noise of fireworks and the ringing of bells. In the Balearics the Moors represent Barbary pirates that terrorized the island up until the seventeenth century. In Pollença the locals celebrate the defeat of the famous corsair Dragut, while two valiant women are the heroes of a battle with pirates, which took place in Soller in 1561. Some provinces with better known reenactments where you will enjoy battles, processions, displays, speeches, plays and ancient dances: Alicante, Cuenca, Granada, Cáceres, Valencia (October, 9th), Saragossa, Toledo, Albacete, island of La Palma, Murcia, Huesca, Almería, Mallorca, Cádiz, Jaén, Teruel, Castellón and Orense. Perhaps the largest and most traditional festival takes place in April in Alcoy, where a papier-mâché castle is erected in the town square. The festival takes place over three days. There are processions on the first day, followed by the battle, and finally the celebration. During the festival the relics of Saint George are removed from the church of Santa Maria and paraded before the townspeople. Alcoy has a Moors and Christians museum where the costumes used during the festival can be seen. As the legend is told, when James I of Aragon reconquered the city of Alicante, the Moors got quite angry and tried to recover it some years later. However, as the battle was about to begin, Saint George miraculously appeared to the Moors, who ran away in fear. The festivities end with the informal and comic retreats. Each filae has its retreat, the kábila for the Moors and the cuartel for the Christians, where a great deal of eating and drinking takes place. 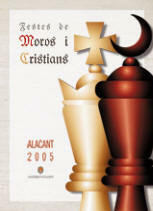 Membership in one of the 28 Moorish or Christian armies, called filaes, is much more than a hobby. The participants meet regularly throughout the year to commune with their brethren, raise funds, organize banquets, and plan out the many activities that make up the fiesta. For them the year starts and ends in April, the time when they don their costumes and march to the sound of the bands. The festival takes place in different areas (barrios) of the city, but not all at the same time: 16-19 March in Villafranqueza, 9-12 June in San Blas; 12-16 August in Altozano; 24-28 August in José Antonio. 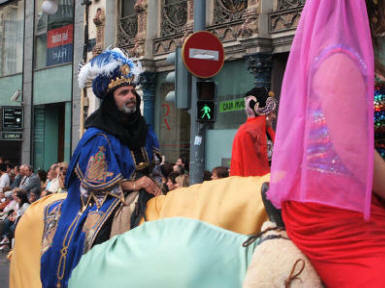 On 6 December the gran desfile takes place; it is a large procession with the Moors and Christians from all the areas. April 22 to April 24. Alicante, Valencia. Starts with the feast of the Holy Christ, in Valverde del Jucar (Cuenca). The townsfolk dress as either Moors or Christians to re-enact the battle for the capture of the castle. A great fun day with much eating, drinking and excitement for all the family. "If you are lucky enough to be invited into a kábila, you will be treated like a long-lost friend. But, to avoid embarrassment, a few rules, not lightly broken, must be observed: first of all, the outfit is by no means fancy dress - the celebration has nothing to do with carnivals- and secondly, the celebration, in spite of its enjoyable nature, is a very serious affair with its own rules and conventions. " 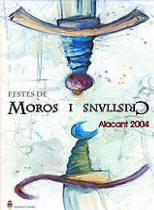 Other remarkable Moros y Cristianos festivals are celebrated in the towns of Biar, Cocentaina, Crevillente, Elda, Muro de Alcoy, Onteniente, Orihuela, Petrer, Villena and some districts of Alicante city. The most ancient festival is celebrated in Caudete (Albacete), dated from 1588. In Alicante it all starts with dianas waking the people up in the morning. They head to the centre of town and await the entradas, the arrival of the Moors and the Christians, as they march through the streets dressed in period costume. "The president boasted at the top of his press conference that we have the support now of Britain and Spain for our attack on Iraq. You know, when you want to make it perfectly clear to the world that you're not an imperialist, the people you want in your corner are Britain and Spain. " From valenciavalencia.com: Valencia celebrates Moros y Cristianos on 9th October, the day when the army of King James I the Conqueror (also the protagonist of the fiesta in Alcoy) entered Moorish Valencia in 13th century. On the eve of the fiesta the Moors occupy the grandiose Gothic city gates – Torres de Serranos. Amidst much noise and gunpowder the embassy of King James arrives in the night to negotiate their surrender. It is a spectacular ceremony in the shadows of the ancient Medieval wall, which transports you back in time. The next day a 4-hour long parade takes place in the centre with lavishly costumed bands of Moors and Christians accompanied by dance, music and fireworks. There is also an event in July, called the Night Landing of the Moors. A mock city wall is constructed on the beach and the Moors arrive in boats, capturing the city. The Christian army re-groups and, after a negotiation between the leaders, counter-attacks amidst much music, gunpowder and sword action. Night Landing of the Moors takes place in July. Click photo to enlarge.